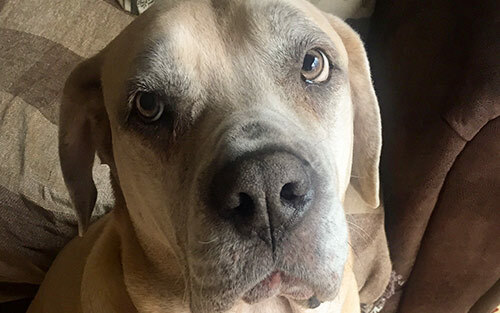 Maisy is a lovely 6yr old Bull Mastiff Cross who came into the hospital in April for her routine booster appointment. At her appointment, Maisy’s owners very sensibly pointed out a small lump they’d noticed on her leg. Vet Krys gave her a thorough examination and took some blood tests. 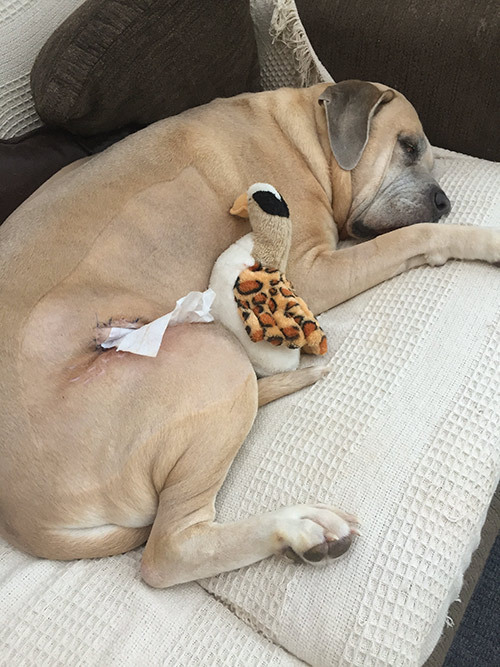 A few days later poor Maisy was diagnosed with a Mast Cell Tumour – a cancerous tumour that needed to be quickly and carefully removed. Six weeks after the surgery, Maisy was finally given the all clear and we are delighted to say that she is doing well. Mrs D’Chaundy was hugely relieved “Maisy has been with me, along with her brother Murphy, since they were small puppies. They are both extremely loving and cheeky and love all the attention they can get. But Maisy is the boss and a massive ‘daddy’s girl’. We first noticed the lump on Maisy’s leg one evening when she tried to climb on our bed! She seemed fine in herself and did not seem bothered by the lump. We presumed it was nothing but thought it was best to get it checked. When we got the call one afternoon at work shortly after her check-up, we were devastated. We thought the worst and got very upset but we were also in shock. “Maisy is a tough girl, but her treatment was a long journey for her. We were so excited when she finally came home. Being a stubborn madam she decided to go on hunger strike which worried us as she never turns down anything edible but thankfully she started eating when we tempted her with home cooked chicken and sausages!